Update: On June 12, 2017, Secretary Zinke reopened the public comment period to accept comments until July 10, 2017. Submit your comments to the Department of the Interior online, or, if you’re pressed for time, customize your message here and we can send your comments to Secretary Zinke. As a part of a review of national monument designations mandated by President Trump’s executive order, Interior Secretary Ryan Zinke is in Utah this week visiting Bears Ears and Grand Staircase-Escalante national monuments ahead of his June 10 deadline to make a recommendation on the future of Bears Ears National Monument. But his visit, billed as a “listening tour,” isn’t listening to much that anti-monument Utah politicians don’t want him to hear. In a marked contrast from former Interior Secretary Jewell’s visit to Utah last summer where she held a public forum, took meetings, and stopped to chat with just about anyone, Secretary Zinke’s three-day schedule in southern Utah doesn’t include any time to hear from ordinary citizens – no open meetings are planned. His only interface with the public is through the press, with a brief slot of media availability scheduled each day. Secretary Zinke is only taking pre-screened private meetings, and though he met with the Bears Ears Inter-Tribal Coalition (the elected representatives of tribal governments that advocated for Bears Ears’ protection) for an hour on Sunday, and with Bluff, Utah-based monument supporters Friends of Cedar Mesa for an hour on Monday, Secretary Zinke has refused meetings with San Juan County-based Native American grassroots group Utah Diné Bikéyah and with the Boulder-Escalante Chamber of Commerce, both of whom would help inform the secretary about the cultural value and the positive economic impact these monuments bring local communities. These viewpoints are necessary to a balanced review, but Secretary Zinke is not listening. The rest of the secretary’s time has been spent flanked by an entourage of staunch monument opponents including Representative Rob Bishop, Utah Governor Gary Herbert, state representatives (including state land transfer proponent Mike Noel), county commissioners, and “property rights” think tank staffers. His company is clearly doing him a disservice to an honest review, feeding him false talking points about what national monuments do and do not do, and what protections are necessary for these cultural landscapes. His statements reveal that the secretary has not studied the Bears Ears National Monument proclamation, which enshrines Native American access and plant and wood gathering. Secretary Zinke also repeated the opposition’s bad habit of holding up an unelected tribal member as if that individual represented and spoke for a tribal government. 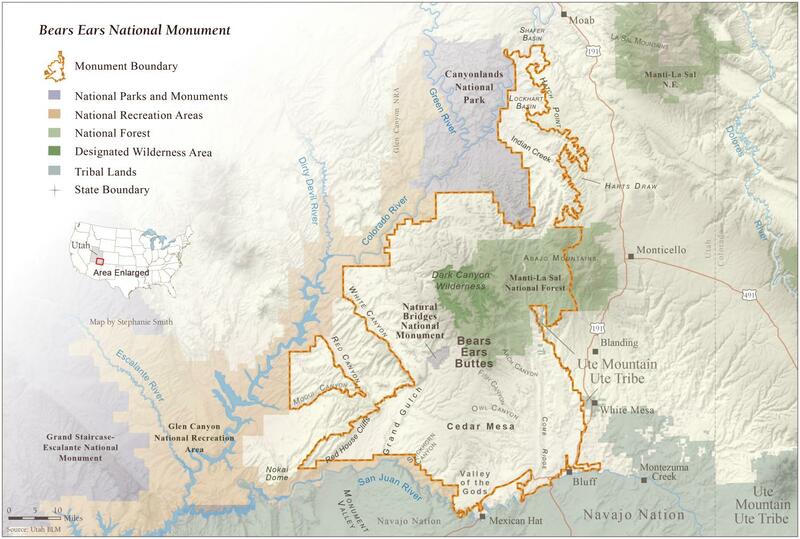 In fact, both tribes with land bases in San Juan County, Utah – the Ute Mountain Ute Tribe and the Navajo Nation – are strong supporters of keeping the monument as it is. The secretary’s statements also undermine the unprecedented nature of five sovereign tribes coming together to protect Bears Ears with the support of hundreds more. At Sunday’s press availability, in a fit of paternalistic pique, and turning the clock back sixty years, Senator Orrin Hatch said: "The Indians, they don't fully understand that a lot of the things that they currently take for granted on those lands, they won't be able to do if it's made clearly into a monument or a wilderness… Once you put a monument there, you do restrict a lot of things that could be done, and that includes use of the land.” When pressed for a specific example, Hatch said, "That'd take too much time right now... Just take my word for it." These statements represent a fundamental ignorance of what Bears Ears National Monument actually is, of the long, deliberative process that led to the protection of Bears Ears, of tribal sovereignty, and of the strong and unprecedented Native American support for the monument. Despite the lack of a formal opportunity, the public has not been dissuaded from making its voice heard. More than a thousand monument supporters rallied at the Utah State Capitol last Saturday, and monument supporters are following the press, staging demonstrations of support where the secretary pops up. With all the “listening,” or lack thereof, going on, and based on his statements to date, it’s hard to fathom that Secretary Zinke’s review does not have a predetermined outcome – to rescind Bears Ears and drastically shrink Grand Staircase-Escalante. There is a bright spot in this, however. The secretary and monument opponents were clearly not expecting the groundswell of public support for Bears Ears. The secretary’s motorcade sat idling in their vehicles for several minutes before Monday’s press availability, clearly deciding whether to speak or depart when confronted with monument protectors demonstrating their support. Though you can’t get more than a quick handshake with the secretary after fighting your way through the media scrum this week in Utah, you can weigh in after May 12, 2017 at http://www.regulations.gov by entering “DOI-2017-0002” in the search bar and clicking “search,” or by mail to Monument Review, MS-1530, U.S. Department of the Interior, 1849 C Street NW, Washington, DC 20240. But you'll have to act quickly – the comment period for Bears Ears will last just 15 days. On the TV, he said, this was public land it was a Monument, and It will be public land, after it is not a Monument!